I was blogging this week for The Guardian about soft drinks - mainly from the point of view of what to drink when you don't drink alcohol. One of the points that came up, however, is how expensive many soft drinks are - volume for volume, often as much as wine. It prompted me to point out (in the unlikely event that you're not already aware of it) how good basic tap water can taste if you tart it up a bit. Step one obviously being to chill it and add some extra ice cubes then to add some extra ingredients as they did in this hotel I stayed in in Chile (above) where they flavoured it with peaches, melon and strawberries. Coils of cucumber also look cool: simply halve a cucumber, peel it and trim off the end then cut it in fine slices with a mandolin or vegetable peeler and drop them in. Lemon and lime obviously taste good too: so much better - and cheaper - than those artificially flavoured waters. 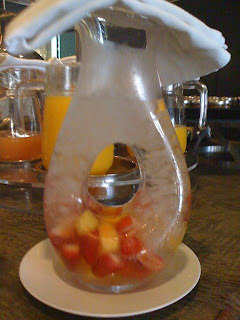 Serving it in a water jug or decanter - easily picked up from a charity shop - makes it look swish too. If you prefer your water fizzy - which I sometimes do - it's worth shopping around. Sainsbury's own brand sparkling water for example is just 40p for 2 litres compared to 69p for the same amount in the Co-op and £1.01 for a 750ml bottle of San Pellegrino, which is over five times as expensive. If you give it the same treatment (added citrus or other fruits) you really won't notice the difference unless you're a mineral water geek. Here's how it came about. We roasted a chicken last night with some new potatoes, rosemary and garlic having started a meal with a green bean and tomato salad. 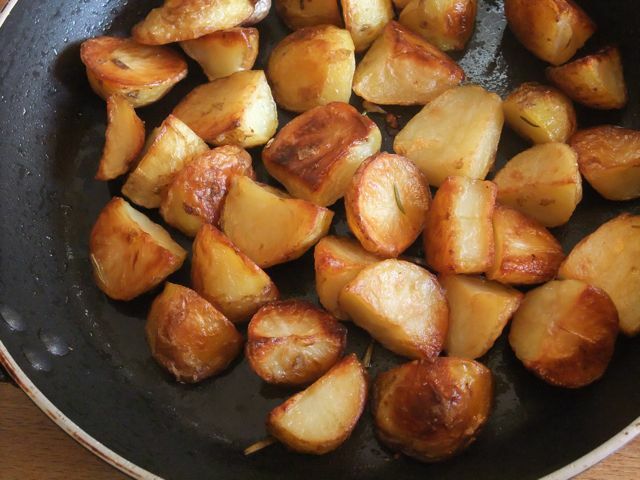 I had two large roast tomato halves left over plus some roasted garlic cloves and enough potatoes to feed four (although I have to admit we managed to demolish them between the two of us which wasn't exactly healthy or frugal). 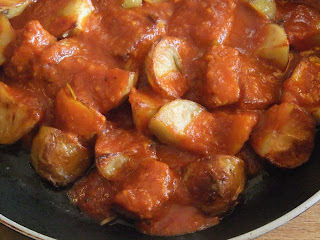 It suddenly occurred to me that I could make patatas bravas by reheating the potatoes (easy in the Aga but I could have dry-fried them over a low heat) and making a spicy tomato sauce based on the tomatoes and garlic. Only I thought it needed a bit more garlic so I heated some olive oil, and fried off a large crushed clove of garlic over a gentle heat. I added a good teaspoonful of sweet pimenton, fried it for a few seconds then tipped in the tomatoes, having first removed the skins along with the roast garlic, jellied chicken juices, a squeeze of harissa paste and a good seasoning of salt. I cooled it for 5 minutes or so then blitzed it in a food processor, reheated it and poured it over the potatoes. And that was that. It occurs to me that you could equally well use this 'brava' sauce with frozen chips or sauté potatoes or make it with tinned tomatoes if you haven't got any ready-roasted. And you could, of course, use hot pimenton, chilli sauce or cayenne pepper instead of the harissa but it does need that spicy kick. One of those dishes that tastes much, much better than you'd expect. I'll be doing it again. This week I ordered a chilled watercress soup (not the one above) in a smart London restaurant. Nothing remarkable about that you might think but in fact it's an all-too-rare occurrence. So rare in fact that they clearly didn't know how to make it. Blending it with cucumber rather than with some sweated off onion and potato, chicken or vegetable stock and a dash of milk or cream, resulted in a dark green pool of what looked - and I suspect tasted like - pondweed. So why don't we see soup more often? It's great for restaurants - a cheap and easy dish to make and good for lunchtime customers who want something light to eat too. 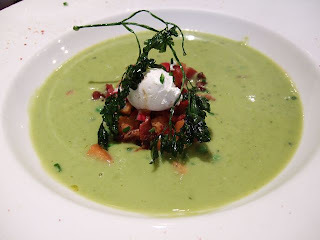 The French have always appreciated soup more, as a way of keeping down the cost of a fixed price menu - this picture was taken a couple of years ago at a Parisian bistro called Les Papilles. But now restaurants seem to want us to go for starters for which they can charge almost the same price as a main course. I suspect many of us take the same attitude at home, preferring fancier, flashier starters instead of one that could really keep down the cost of a meal - and be made ahead rather than at the last minute. When was the last time you had soup at a friend's house - or served it at your own? Wash the watercress thoroughly, chop off the stalks and roughly chop the leaves. Heat a saucepan or casserole and add 2 tbsp olive oil and a small slice of butter. Add a chopped onion and cook for 3-4 minutes then add a finely sliced medium sized potato, stir, cover the pan and cook on a low heat for another five minutes or so. Add the watercress stalks and 600ml chicken or vegetable stock, bring to the boil and cook until the potatoes are almost cooked (about 10 minutes) Add the chopped watercress leaves bring back to the boil, cook for a couple of minutes then take off the heat and cool slightly. Pass the soup in batches through a liquidiser until smooth then return to the pan and reheat gently without boiling. Add milk or cream if you want to thin the soup or give it a creamier texture. Season to taste with salt, pepper and a small squeeze of lemon juice. You can serve it hot, warm or cold. I prefer the former. Frugality, as I've said before, isn't just about buying cheap but making the best use of what you buy. And nowhere is this more true than of beetroot leaves and broad bean skins, that get discarded from the now seemingly compulsory double podding process. This week I've found uses for both. First the greens, because that was a triumph, though I say so myself. I turned them into a Greek style spanakopitta by wilting them then mixing them with chopped spring onions and a little garlic softened in a mixture of oil and butter and some feta-style ewes' milk cheese I'd impulsively bought in the farmers' market then stuffing them into a filo pastry case. Really pretty and really tasty. Wash the beet leaves and rip the leaves off the central rib. (If you're feeling exceptionally frugal you could stir-fry these) Pile them up in a saucepan without any extra water, put on a lid and leave over a low heat until the leaves collapse, turning them once or twice. Don't cook them or you'll lose the colour. Drain them in a colander then squeeze out the water and chop. Meanwhile warm the oil in a small frying pan and add a quarter of the butter. 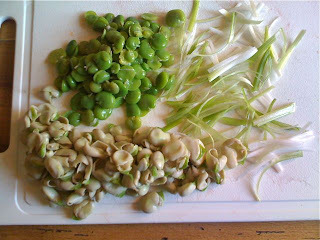 Add the crushed garlic and spring onions and cook for a minute or two until soft. 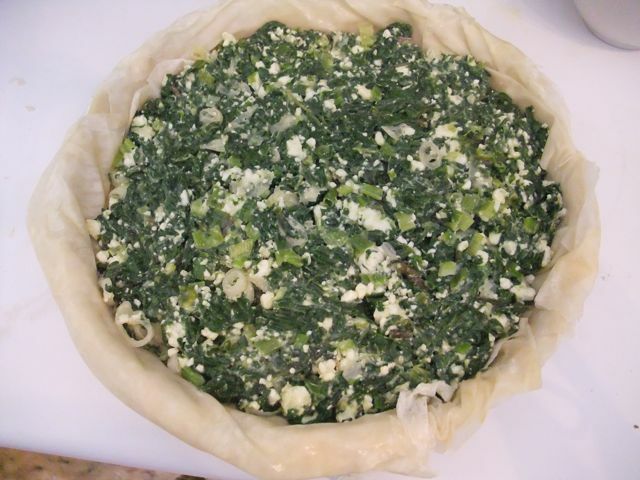 Set aside to cool then add the chopped leaves and crumbled cheese and about two thirds of the beaten egg. Season well with pepper and a little salt if you feel it needs it. 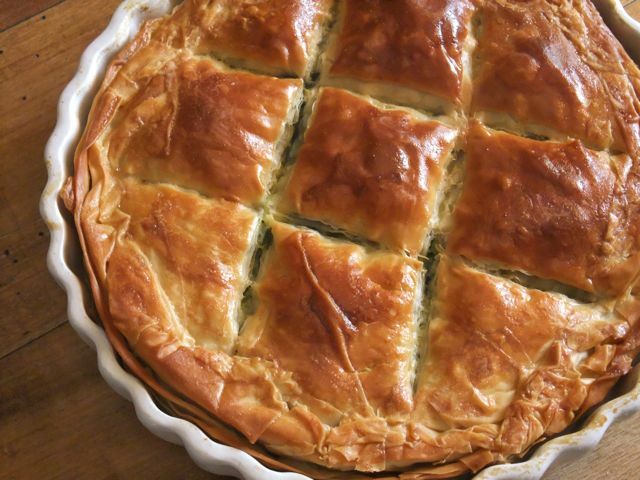 Take the pastry out of the fridge and let it come to for 20 minutes. Remove the packaging and wrap the filo sheets in a damp tea towel so they don't dry out. Melt the remaining butter. Take the filo sheets one by one and brush them lightly with melted butter and lay them into your dish or tin. Use just under half the filo sheets, layering them up so the whole base of the dish/tin is covered. Cover with the beet green filling then lay the remaining buttered filo sheets over the top. Tuck the edges in neatly (the beauty of filo is you don't have to do it evenly) and brush with the remaining beaten egg. You can cut the pastry into diamond shapes as I've done but you don't have to. Cook in a hot (225°C) oven for about 20 minutes until the pastry is well browned then set aside. Serve warm or cool but don't refrigerate. I was about to chuck my broad bean skins, I must confess, when it suddenly occurred to me you could make a nice little tapa with them. 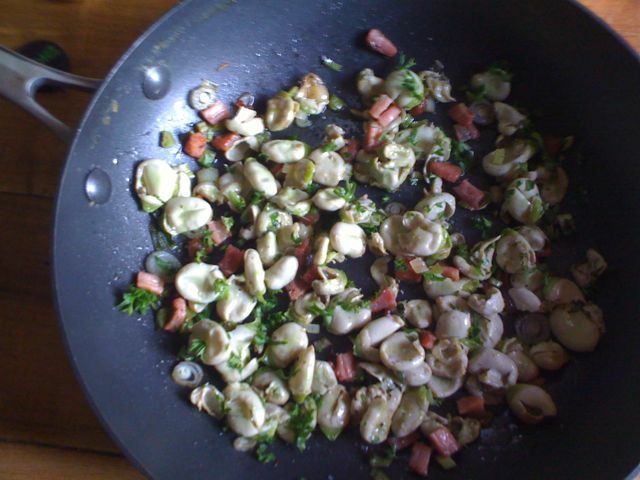 So I sweated off a bit of chopped pancetta - again from the farmers' market - in some olive oil with a couple of chopped spring onions and a crushed clove of garlic then simply turned the beans in the flavoured oil to warm them through. Actually I cooked them for a minute, hence the rather dull colour, but you don't need to provided the skins aren't too tough. And if they are you wouldn't want to make the dish anyway. Not a great photo but you get the idea.